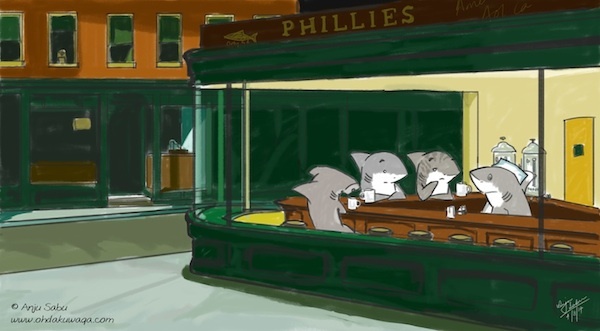 Here's my rendition of "Nighthawks" by Edward Hopper. This is another painting I saw for the first time at a friend's place. It must be nostalgia month or something. This is also another picture that has been parodied by several people. I haven't seen a Shark one yet though. I wonder if I should change some of the sharks. I wasn't too sure about the Tiger and Oceanic. And it's missing the red but I'm not going to make it look as if my shark was bleeding.